Continue Your Adventures at Home! Buy Your Traveling Map Now and Continue Your Adventures at Home! MARK YOUR ADVENTURES - With Donovate Scratch Travel Map the adventure doesn't stop when you come back home. Gather your family together, grab the guitar pick and tell them about your travels while peeling off your gorgeous scratch off world map! LARGE AND ACCURATE - Measuring 22 x 34 inches, Donovate Scratch-Off World Map Poster is large enough to look great on a wall and also easy to frame. As a bonus, the high accuracy of the Scratch Off Map with States recommends it as a fun educational tool! ZERO SCRATCH DAMAGE - Unlike other travel scratch map on the market, Donovate Scratch Off Map of the World is a breeze to scratch. Use the included accessories to peel off the exterior layer of the scratch travel wall map and reveal the vibrant new world beneath! SCRATCH OFF MAP KIT - With each world travel map purchase you will receive ball pins, memory stickers, two guitar pick scratchers, a magnifying glass, a felt cloth, a cool storage bag, and a free guide. To make things even better, the travel map comes in a gift-ready! 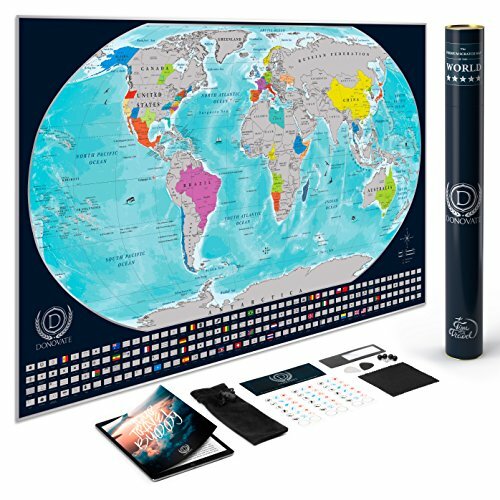 30 DAYS GUARANTEE - Donovate Scratch Off World Travel Map is printed on high-quality art foil, luxuriously coated with an easy to scratch layer. If the scratch away map is anything but perfect for you, just send it back within 30 days for a full refund! If you have any questions about this product by DONOVATE, contact us by completing and submitting the form below. If you are looking for a specif part number, please include it with your message.